There must be at least 2 dozen motivators for implementing a Managed Print Services program – but fear should not be one of them. As a matter of fact, fear should rarely be a motivator. So when I read this article about a 32 year old receiving clerk, bilking some hospital out of $3.8 million by ordering and fencing toner-ink cartridges over the past 6 years, I was reminded of the Great Governor French Copier Lease Caper and the Missing Copiers in Cleveland Swindle, The Beaverton Ink Bandit and the Funky New York City Department of Education 6,759.33% contract overrun. 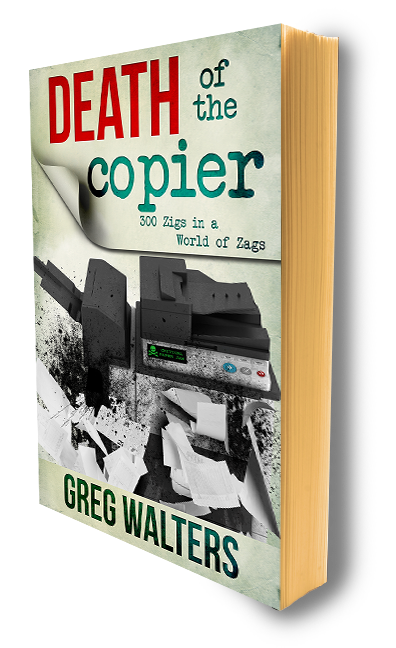 From Detroit to Washington State, crime and shenanigans around copiers and supplies abound and are timeless. Before you email this article to your sales staff and all the hospitals in your territory, slow your roll, chisel chest. First ask yourself, “How in the world did an organization allow this to happen for six years?” Six years. Is it because the hospital didn’t have an MPS program? Or is it because they don’t have the correct procedures and processes in place? If this hospital can’t manage toner, of all things, how much are they losing in Q-tips, linen service or trash removal? Or laptop refreshes and copier leases? How many ‘scripts get lost between the nurse’s station and the pharmacy? How many of their customers experience a less than pleasurable visit or fatal event? This is a human condition – corruption. Throwing MPS into this gaping maw of bad behavior, no oversight and illegal activities is simply asking for trouble. And remember, MPS is a magnifying glass – it makes the good processes better and the bad processes worse. Yet,imagine, for a second, you landed the opportunity to assess this environment last May. Somehow, you load a DCA and get interview time in A/P. And as you review Office Depot invoices you notice an “anomaly”, this particular million dollar anomaly. Ok, Mr. MPS God, what in the hell do you do with this information? The shipping clerk probably acted alone. But this is the Big Apple (don’t mind the maggots) – how do you know this isn’t some huge, thug driven, or organized crime operation. Perhaps the A/P clerk is on it too. Or maybe this goes all the way to the top – the local union rep. The makings of a bad movie, and there you are, right smack-dab in the middle. We sell MPS. We typically do not carry any “heat”. When things get dicey, how effective will throwing your iPad at them be? Bad joss, my friend, bad joss. Turn around, and walk away. One other thing caught my eye – Office Depot. All across the country, Office Depot has been accused and at times admitted to routinely over-charging customers; Public Sector customers. Interesting, birds of a feather and all that. Let the old-skool-trained ones run with this , they’re use to this level of putrefaction.